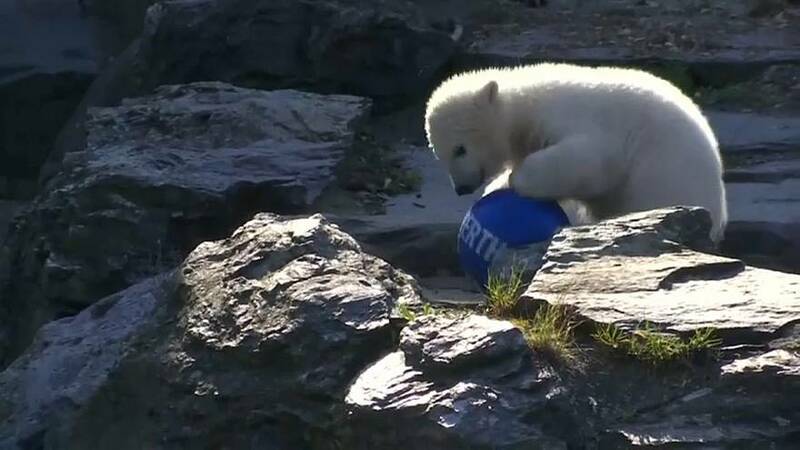 A four-month-old polar bear born at Berlin's Tierpark Zoo has been named Hertha, after the Bundesliga club, which will be her sponsor. Hertha seemed happy with the choice, enthusiastically chasing her own personalised football at a naming ceremony attended by a small crowd of onlookers. Zoo director Andreas Knierim said Hertha was making great progress and that she had already put on lots of weight thanks to her mother's milk. "During the second vaccination appointment, she tried to bite into people's hands, which shows that she has her individual character," he said. So we are very, very happy about what is happening here, that her mother Tonya is doing such an excellent job and that the little one is gaining social competencies." Knierim also discussed the particular complexities of choosing a name for a polar bear, saying: "Finding the appropriate name is not always easy. It could be a name from the country of origin, which with polar bears is a little difficult because it could be Canada and it could be Russia. They come from a huge area." Berlin's last star polar bear was Knut, who was famously hand-reared by a zoo keeper after his mother rejected him as a newborn. Thousands of visitors queued for hours to watch him frolic in his enclosure, and he inspired an array of merchandise. Knut died suddenly in front of hundreds of stunned visitors in 2011, aged four, after he fell unconscious into a pool of water at his enclosure. The polar bear suffered from encephalitis, an inflammation of the brain, which caused him to collapse before he drowned, an autopsy indicated.